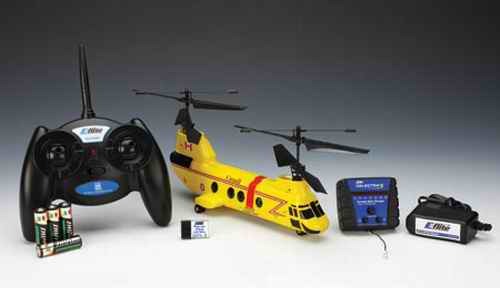 mCX Tanem Rescue Twin Rotor Coaxial RC Helicopter - Looking Good! After seeing E-flite's mCX Tandem Rescue for the first time I was immediately taken with the scale theme on this bird. As a Canadian, it was great to see E-flite's newest mCX offspring boasting the famous high visibility "yellow banana" search and rescue colors that have made the Boeing CH-113 Labrador such a familiar aircraft up here in the "Great White North". 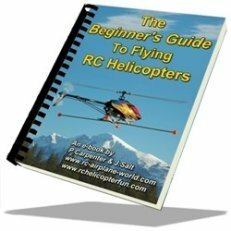 Using a micro coaxial platform in a tandem rotor micro electric RC helicopter is nothing new of course with several offerings out there. So is E-flite's version any different? Oh Ya! The reason the mCX Tandem Rescue has me and so many others excited is the fact that it is based on the Blade mCX making it an instant success. Durability, value, parts support, DSM2 modulation, quality, and perfect indoor size all rolled into a nice yellow package. E-flite could have done what most others do and use the larger Blade CX coaxial platforms for this tandem. It would be heavy, clumsy, harder to control, and cost a good deal more to repair in the even of a crash, just like the rest of the micro electric tandems out there. By using the light weight and small mCX, this is a Tandem that will take some abuse plus be much more fun to fly in the hands of first time pilots right up to RC heli obsessed folks like myself; especially in smaller indoor areas. At just over 15 inches long, it is the perfect size for this application. Here's Jim and Mark showing what this heli is all about! How Does The mCX Tandem Rescue Work? The first thing that I noticed when looking at the Blade mCX Tandem Rescue is there is only one linear servo controlling the aileron function (cyclic roll) and no elevator servo (cyclic pitch). Yes, there is a swashplate on each lower rotor head, but only cyclic roll, no fore/aft pitch movement. The mCX Tandem Rescue instead uses changes in lift between the front and back rotors to pitch the heli forward and backward - BRILLIANT! This not only saves a little wight by eliminating a servo and respective linkages, but makes the mCX Tandem Rescue pitch more like a real CH-113 or Chinook CH-47 helicopter. The result is such a realistic looking forward and backward flight attitude plus it offers some interesting flight characteristics. 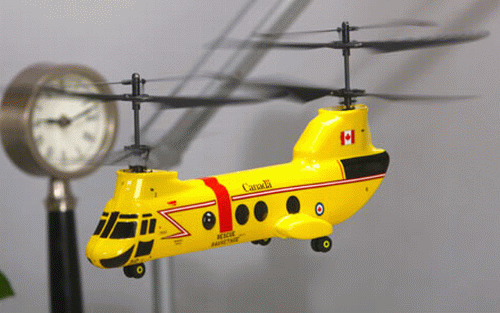 These include the ability to yaw around the mCX Tandem Rescue heli's center of rotation or the nose of the helicopter. That characteristic alone pretty much sold me on this yellow bird as well as the stability offered by using rotor lift to adjust pitch attitude. All this control is possible due to a brand new 5 in 1 unit that seamlessly mixes all 4 rotor motor speeds to achieve lift, pitching, and yaw movement. The built in gyro works just as well as it does on the mCX or mCX-S300 , and of course, there is the one linear servo to control the swash cyclic aileron (roll) on both rotor swashplates by means of an interconnecting linkage. The DSM2 receiver is the final bit of circuitry which is cramed into the "brains" of this bird and allow us to bind the mCX Tandem Rescue to any DSM2 Spektrum or JR radio. You know I think that is one of the best offerings E-flite has ever come out with. The new 5 in 1 also controls one other nice little added bonus on the Blade Tandem Rescue - Semi-Scale LED lighting. Yup, the mCX Tandem Rescue boasts LED lighting already installed in the model. You don't have to go out a purchase an accessory light set like with the Blade CX3 . Good job E-flite and Horizon Hobby! The one thing that really puzzles me however is why this Blade Tandem Rescue RC helicopter is only available in a ready to fly version and not a bind and fly (BnF) version? I hope this is just because it is a very new release and the BNF versions are a few weeks behind in the first production runs. As it turns out a Bind & Fly version has been introduced (Item # EFLH2580). Of course since the Blade mCX Tandem Rotor is running two more motors/rotors and weighs about twice as much as a stock mCX, it is going to be fairly power thirsty. 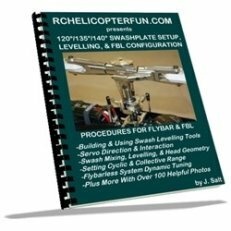 E-flite has two solutions. First off is a new 3.7 volt 250 mAh single cell LiPo battery . At over twice the capacity of the standard LiPo pack that comes with the mCX flight times of around 8 minutes should be very possible. Pair that battery up with an entirely new charger - the Celectra 1S 3.7 Variable Rate charger. This charger features a variable charge rate from 0.1 amps up to 0.7 amps in 0.1 amp increments. Not really that beneficial as far as I am concerned, but it will allow you to charge the smaller 110-150 mAh packs from your mCX's or ParkZone Sukhoi's at lower rates to avoid damaging the pack as well as the larger 250 mAh pack that comes with the mCX Tandem Rescue at higher rates up to almost 3C at 0.7 amps. Included with the kit is a 1.5 amp AC to DC adapter that enables you to power the Celectra 1S 3.7 Variable Charger from any AC electric outlet in your home or office. 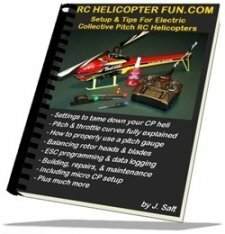 I know I don't even have to say this, but as a scale heli guy and a fan of E-flite's micro coaxial heli lineup, the mCX Tandem Rescue is getting a "highly recommended" rating from me if you are into tandem rotor birds. It is always nice to get some indoor stick time during another cold Canadian winter. With the huge price drop (now down to $99.00), there has never been a better time to get a micro tandem heli.